Urbino Collection four door Vitrine in High Gloss White Lacquer finish with contrast metal door catches to the top of each door. 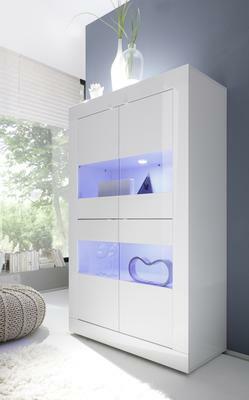 Wooden doors with clear glass panels, internal three shelves finished in white lacquer finish with two colour changing LED Spot light. Supplied with remote controller, 16 light variations including standard white. Ideal Display and Storage for Living and Dining rooms. Finish: White High Gloss Lacquer.